Touring a station for the first time invariably delights the boyish explorer inside of me. Main Street had thus far eluded my awareness—I’d never ridden the Carlton streetcar to its eastern terminus. Nor had I ever stopped off here, when riding the subway. What marvels would I discover? Main Street, it turns out, is the pinnacle of the Bloor-Danforth line’s fastidious, utilitarian style. 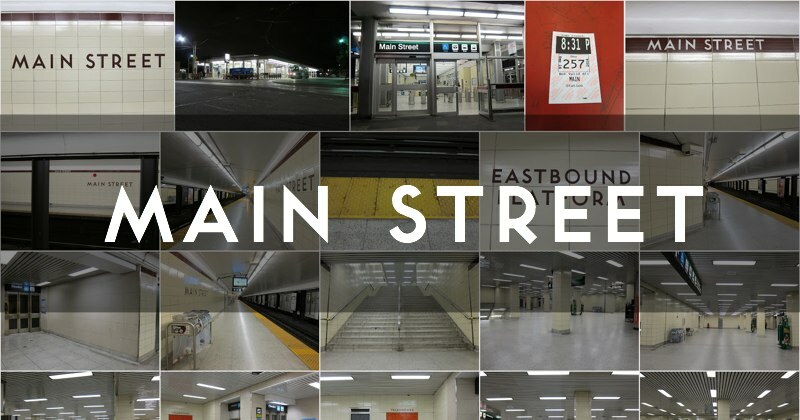 A single glance is all it takes to realize that Main Street is a 60’s-era TTC subway station. The familiar thematic motifs are present: The rectangular structure. The plain brown brick. The extended platform canopy. The thin white support columns. The glass windows with the hip-height colour banding. Everything seems governed by the (inexpensive) template. Main Street was uniformity’s clearest expression; with the continuations of the Bloor-Danforth line to the east and west suburbs, the TTC felt increasingly emboldened—perhaps even obligated—to propose ever more complicated, less conformist station flourishes and architecture. Main Street opened May 10, 1968. Its ‘closeness’ to the Danforth GO line makes it a candidate for a regional transport mobility hub (the station is 270 meters from the GO connection; in the late '80s the provincial government considered building a connecting tunnel, but nothing ever came of the idea). The station was named after Main Street, the primary street of the suburban town of East Toronto, which was amalgamated into Toronto in 1908. The facility retained the ‘Street’ in its name to prevent disoriented out-of-town visitors from mistaking it as the ‘Main station’ of the system. Note the incomplete station name.